Unveil New Lyric Video "Queen Of Hearts Reborn"
Just in time for the upcoming XANDRIA tour, the band unveiled a brand new lyric video for the track "Queen Of Hearts Reborn" off of their latest effort Theater Of Dimensions! Check it out below. 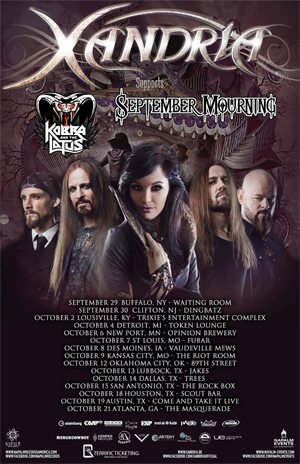 XANDRIA are touring in support of their latest release and seventh studio album Theater Of Dimensions. The album is a hyper-emotional affair that digs deep, lyrically speaking. It's also an incredibly metallic effort. There is a soundtrack-like, orchestral finesse inherent to the compositions, echoed by pounding groove and sophisticated shredding. "What would be more fitting after the great success of our 1st North American Headlining run in may than doing a 2nd stretch in October? Right...nothing! Well, except doing another one with our buddies from KOBRA AND THE LOTUS! Hell Yeah!! So many cities we haven't rocked so far! Well here we go again! Get your tickets NOW! Because THIS Is going to be AWESOME!"